When seen on a map, Anthony Dunsford’s responsibilities appear as a few hundred hectares of open space. But in 2017, that open space attracted over 40 million visits. Dunsford is the director of visitor experience for Botanic Gardens and Centennial Parklands (BGCP), overseeing customer experience at four of Sydney’s most iconic recreational spaces, including the Royal Botanic Garden Sydney. It is a role that requires careful balancing of the desires of commercial operators against the needs of a wide variety of Sydney residents, within an urban environment that is demanding more and more from its open spaces. BGCP was formed from the merger of two separate bodies earlier this decade. Since that time, Dunsford and his team have raised annual visitors to the Royal Botanic Garden Sydney from 3.9 million to 5.4 million. Many of BGCP’s sites are self-funded, placing pressure on Dunsford and his team to maximise revenue without compromising the experience of users. “Our assets are available for all in the community to use, so that’s why we have to cater for all of those different segments,” he says. “I have a framework for major events, and those events have to cover diverse segments. So there is a limit on how many music festivals, versus garden shows or food festivals that will appeal to a completely different demographic. Rising customer expectations has led to the need to improve the food and beverage offerings in the various locations. With many of these facilities operated by licensees, Dunsford employs mystery shoppers to ensure they are meeting BGCP standards. Dunsford has also invested in the parks’ online and social presence, making extensive use of the review functions on services such as Facebook and TripAdvisor. 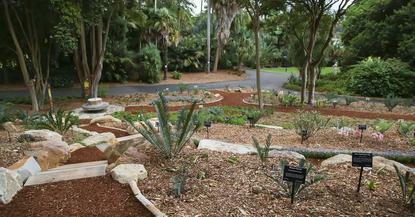 BGCP has also installed Wi-Fi throughout the Royal Botanic Garden Sydney in conjunction with Optus, bringing connectivity to 63 hectares of foreshore. “Three years ago in the Royal Botanic Gardens Sydney there was no active social media channel, there was no digital marketing team, the websites weren’t accessible and you couldn’t book our products online,” Dunsford says. “So in three years we have created a very effective and accessible website and already refreshed it once. You can book all of our products online, we have a social media strategy, and our community is up over 200.000 across all of our channels, and I have a digital marketing team. Given the need for balance, one of Dunsford’s key accomplishments has been to drive down the number of complaints made about park usage, to the point where one recent music festival at Centennial Park not only received no complaints, but actually attracted a compliment. He attributes this to better communication with residents, and to better technology. “With sound management now you can create a great sound experience at ground without that affecting all of the surrounding neighbours,” Dunsford says. The changes made by Dunsford and his team were reflected in the Royal Botanic Garden Sydney recently winning bronze at the Australian Tourism Awards for Major Tourist Attraction – the first time in its 200 year history.